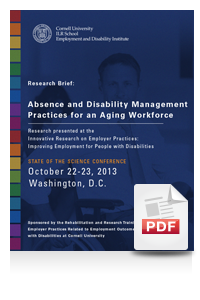 This project presents a survey, conducted in collaboration with the Disability Management Employers Coalition (DMEC), which examined leading practices for retaining an aging workforce from the perspective of over 800 disability management professionals. 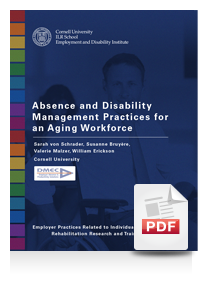 The goal of Disability and Absence Management (A & DM) programming is to limit absence, control costs, and retain workers to maintain a productive workforce. This can include the development of supportive policies (e.g. flexible work options), manager and employee education, supportive benefit programs, return to work programs, among others. The goal of Disability and Absence Management programming is to limit absence, control costs, and retain workers to maintain a productive workforce. This can include the development of supportive policies (e.g. flexible work options), manager and employee education, supportive benefit programs, return to work programs, among others. Increasingly, older workers have become a group of interest among Absence and Disability Management professionals, in part because many baby boomers are forgoing retirement and working longer. Projections suggest that by 2020 those 55 and over could account for 25% of workers. This shift is especially important given that disability prevalence increases with age — as the workforce ages, organizations will increasingly need to ensure their programming supports older workers. During the fall and winter of 2012–13, Cornell University's Yang-Tan Institute and the Disability Management Employer Coalition (DMEC) collaborated on a survey and key informant interviews with DMEC members and conference attendees to learn more about what organizations are doing to respond to and prepare for an aging workforce.